This one is another request from Jake, well, sort of. He wanted a starship, but when I sat down, this is what ended up coming out. We'll see if this passes scrutiny. Once again, if anyone has anything they want to see me sketch, leave me your idea in the comments and I will see what I come up with. You charlatan! I asked for a STAR ship, not this super awesome steampunk airship nonsense. The nerve. 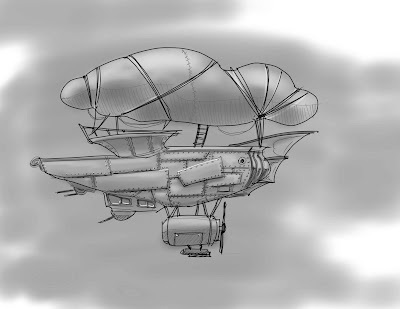 What a sweet airship. Your style is addictive!